Definition at line 58 of file StoreStats.h. Definition at line 58 of file StoreStats.cc. Definition at line 64 of file StoreStats.h. 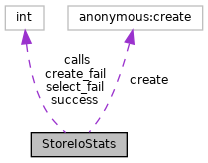 Referenced by Mgr::StoreIoAction::collect(), and storeCreate(). Definition at line 66 of file StoreStats.h. Definition at line 65 of file StoreStats.h. Definition at line 67 of file StoreStats.h.